The Micron Horizontal Filter is a space-saving high performer; its compact horizontal design allows installation with minimum waste of space. The shape of the Micron horizontal filter is both attractive and functional. The spherical ends are designed to give uniform flow from both inlet and outlet collection assemblies.Micron Horizontal filters are available with 500mm (M) filter media bedand a 1200mm (MD) filter media bed. • Elliptical positive sealing manways. • Flanged port of up to 10”. • Hydraulically balanced distribution and lateral system. • Fibreglass wound tank, UV and corrosion resistant. • Large stable filter base for stable floor mounting. Waterco's looped lateral configuration ensures optimum water filtration and balanced fluidisation of the filter bed during backwashing. Its individual laterals are shortened while maintaining filter media bed coverage,reducing the friction head loss of each lateral,further improving the filter's hydraulic efficiency. Micron Horizontal's looped lateral system reduces backwash run times,saves water and produces flatter more uniform filter media bed after backwashing. 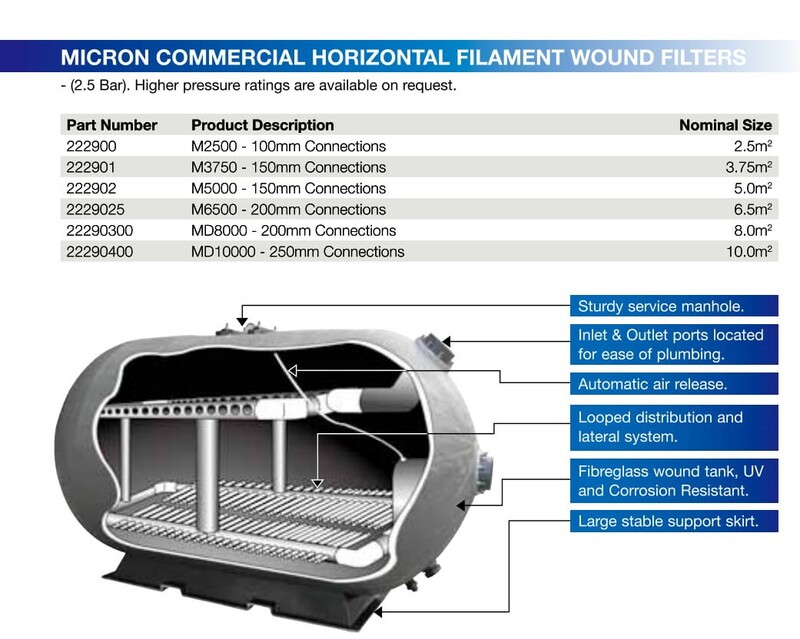 Micron Horizontal's looped lateral system can be contruscted to allow the introduction of air during backwashing.